Yemeni army forces responded to the soldiers from Sudan who have reportedly been fighting on behalf of the Saudi-led coalition, backed by the US, in the frontline of the deadly war on Yemen, with money being their only motive. Snipers unit of the Yemeni army forces on Tuesday managed to shoot five Sudanese paid fighters hired by the coalition in Hajjah province, northern Yemen, a military official told YemenExtra. According to the official, the five Sudanese paid fighters were killed in sniping attacks, which took place in the northern part of Midi desert. The head of the Supreme Revolutionary Committee, Mohamed Ali al-Houthi, said that the Sudanese regime sent new fighters to Yemen to fill the deficit of its fighters after their loss in it. Al-Houthi said on his twitter page, the system of the Sudan fills a deficit in its fighters in Yemen to send new instead of who killed in it, adding that this system must firstly fill the deficit of the economy less than the equivalent of Saudi Arabia and its allies to end the crisis which the Sudanese people suffered in exchange for the continued killing its recruits, pointing out that the Sudanese regime is only proficient in bloodshed at home and abroad. Mohammed Ali al-Houthi, commented on reports concerning the recruitment of Sudanese children by the Kingdom of Saudi Arabia. “Recruiting children from Darfur, Sudan is a scandal that forms the most heinous crime committed by the Saudi regime,” Mohammed Ali al-Houthi said on his Twitter account . A Sudanese paid fighters hired by Saudi army revealed important facts exposing the rumors used by the coalition’s regime in its war against Yemen. Sergeant Abdallah al-Siddiq Mahmoud Abdulrazak, a Sudanese national who held military number 981056, said that he arrived in Saudi Arabia to defend the holy Ka’aba, but was instead sent to the southern border in Jizan province, where he found US planes and armored vehicles in Saudi territory, explaining that the Sudanese regime threw him and many other Sudanese people into the unjust war against the Yemeni people, for the sake of Saudi dirty money given to the regime of Sudanese president Omar al-Bashir, and calling on his colleagues and brothers not to believe the Saudi propaganda of the unjust war against Yemen, and stated that the Yemeni army defends their homeland with dignity. About 360 Sudanese Janjaweed arrived last year in the town of Khokha from Aden province.The arrival of 240 paid fighters of the Sudanese army to the city of Khokha through 6 buses for mass transport. 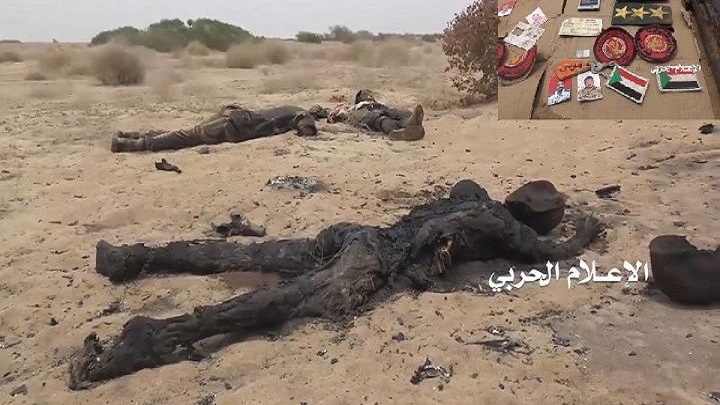 Ansaruallah’s Spokesman, Mohammed Abdulsalam published on his Twitter account photos showing Sudanese dead soldiers and prisoners captured by the Yemeni army during the battles in Yemen’s western coast. “The Sudanese dead and prisoners in the western coast are victims of exploitation of the Sudanese regime in an unjust and unjustified war,” said Abdulsalam, confirming that the Sudanese regime would gain nothing but losses and destruction from its hostile positions towards Yemen. Mohammad Ali Al-Houthi called on Sudanese families to conduct “autopsy” for their sons’ bodies who have been killed in Yemen. In a tweet, he confirmed that there is liquidation process for Sudanese soldiers who are fighting in Yemen alongside with Saudi-led coalition as “Mercenaries”, calling them to re-autopsy bodies of their recruits, and they will find out that most of them were killed from the “back” by their colleagues in the battlefields, stressing that seeking for money by al-Bashir caused the bloodshed of Yemenis and the collapse of the Sudanese economy. A member of Sudan’s parliament, Hassan Osman Rizk, called on the Sudan government to withdraw its troops from Yemen, which is fighting under the leadership of the forces in Yemen. “Sudanese soldiers are not obliged to protect any legitimacy outside his country”, Hassan Osman Rizk said.Rizk was wondered by President al-Bashir’s speech to the National Assembly about the country’s ability to intercept any ballistic missiles fired by the Yemeni army to Sudan.